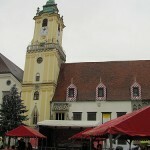 The Main Square (Hlavne Namestie) is the center of the historical center of Bratislava. At this square you can find the Old Town Hall. Parts of this building dates back to the 15th century and the famous clock tower can be seen from all over the inner city. Beneath the town hall you can find a very popular tunnel. Another famous sight at the Main Square is the Maximillian Fountain. 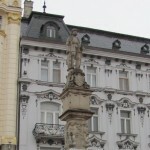 This 10,5 meter high statue is also known as the Roland Statue. 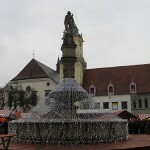 Several legends are attached to it and according to it the knight looks towards the town hall throughout the entire year. Yet, at the stroke of midnight every new year he turns around and bows in the direction of the former town hall.